What are the Best Blinds for Your Kitchen? The kitchen is heart of every home, so ensuring that you have the right atmosphere in there is extremely important. In recent years, it seems as though dining-specific rooms are becoming less and less popular – perhaps because we’ve realised just how versatile our kitchen space really is! However, to ensure that we have the right mood for evening dining, the appropriate lighting is paramount. 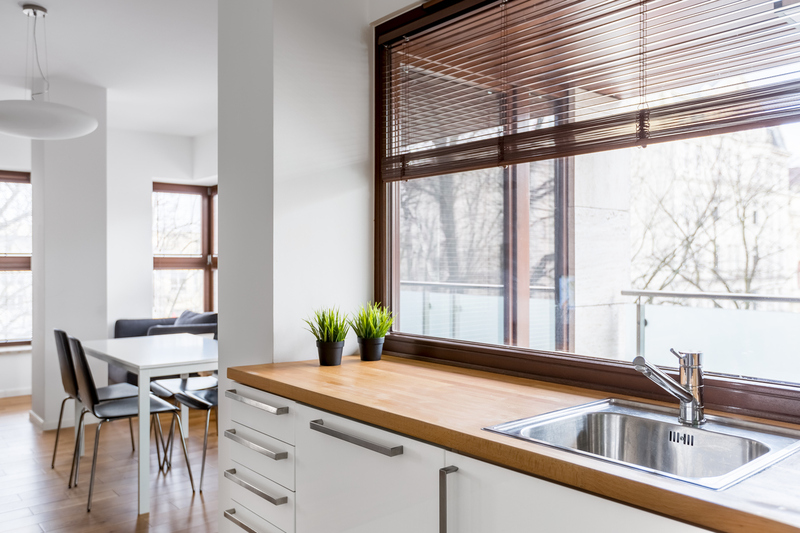 With this in mind, in this article we’ll be taking a look at the best types of blinds for your kitchen and the various benefits each of them grant. Given that windows above sinks are exposed to moisture and often prone to condensation, the style of blinds that you choose here is very important. As wooden blinds are known for their tendency to readily absorb moisture, they would be a poor choice in this particular scenario. Instead, why not opt for metal blinds? They are particularly resistant to moisture, making them the perfect candidate for those kitchen windows. Whether your meals are simple or a little more exotic, everyone creates some kitchen pongs when they cook. Even if they smell nice at the time, once they’ve had a little while to settle they will stick to your soft furnishings and truly outstay their welcome. To combat this, roller blinds are a safe bet. Given that they are not made of soft fabrics that will soak up odours, you can cook to your heart’s content. It’s also worth mentioning that roller blinds feature a variety of different patterns and colours, so you can add a bit of visual spice to your kitchen, too! Since we tend to spend a great deal of time in our kitchens, privacy is important but, that said, so is natural light. To reconcile this problem, we recommend opting for Venetian blinds. Venetian blinds strike the perfect balance between privacy and light control, meaning that you simply alter the angle of the slats depending on the time of day and the mood you’re in. Given that, for many homes, the back door and its accompanying window can be found in the kitchen, you will want to take this into consideration when choosing the blinds for your kitchen. While some windows may be frosted, others might not be, and for a lot of people the decision whether or not they’ll install a blind on their back door boils down to this. If you do want to install a blind here, you will want to do so in a manner that’s in keeping with the rest of your kitchen. Sunstopper Blinds stock high quality blinds at affordable prices throughout Ware, Hertford, Welwyn Garden City and the wider Hertfordshire area. Our range of products includes wooden blinds, Luxaflex blinds, vertical blinds, canopies and awnings, to name just a few, and our expert fitters ensure that your blinds are installed perfectly into your home with minimal fuss. For more information on any of our products, contact one of our knowledgeable advisors today. We’ll be happy to help with any enquiries you may have. « Metal or Wooden Venetian Blinds?